There is no feeling or experience quite like flying. Watching someone make progress toward getting their wings is deeply rewarding. 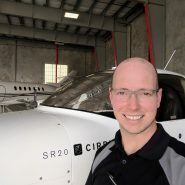 Making them a safer pilot, through instrument training, and added ratings is what it is all about. We all think in different ways; we all learn in different ways. Your instructor should teach in a way that suits you. I enjoy getting to know students and making lessons that just click with a student. The students I learned alongside while getting my ratings are all over the country now, flying all types of airplanes, for all types of companies. The opportunities that you open when earning a flight rating are incredible.